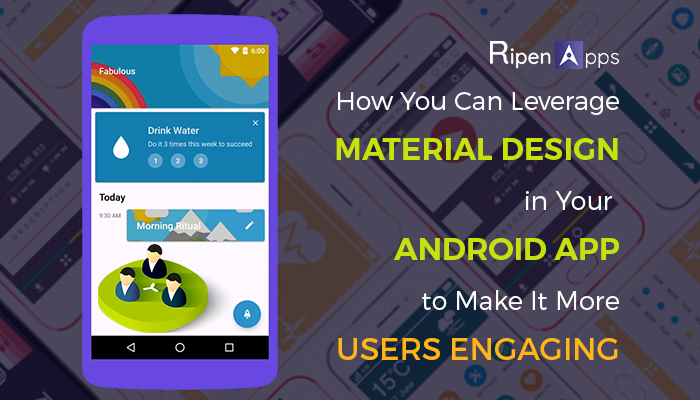 How You Can Leverage Material Design in Your Android App to Make It More Users Engaging? Although the mobile ecosystem has teemed with apps and the competition is undoubtedly high & you need to develop a high-performance android app that delivers quick & consistent solutions to problems your target audience grapples with. If you want to develop an app that could be stand out on top among the crowd, then one mantra that every mobile app developer should avail is “Create an app with user engaging quality” also. Have you heard that proverb “The first impression is the last impression?” Yes, this goes the same with the mobile app development too. Designing is the first & user-engaging element that could work as a brand image for your mobile app. An intuitive designing along with the active mobile app development is mandatory. It is not enough to develop an app that is free from all bugs and working flawlessly, but you need to deliver an eyes-captivating designing also to engage or attract more users. UI & UX are the two mobile app elements that decide the present & future of the mobile app along with mobile app designing company who have designed or developed it. Entire proven tips to augment the mobile app UI get concentrated on one element and that is Mobile App Design. Experience of the user entirely depends on the design of the Android app and the way you have designed that app. In the modern world, everyone wants the app that looks the same way as their real-life elements feel. Now if we talk about the creative & interactive design element which gives the feeling of the material world, we are happy to tell you that Google with its Material Designing gave the mobile app developers the much need aid. The material Design language is a design language, which introduces in Android Lollipop version in November 2014, which is involved with the suite of tools for streamlining the way teams works, design, and builds apps. The design standard that made an appearance 4 years back, now allowed mobile app designers to inculcate their color palette in the app, offer screen transition, bring in new system widgets, and animation. In past days, Google was lying behind the Apple regarding intuitive & creative mobile app designs, but with the Launch of Material designing, it has come to a step ahead. Material Designing has been proven that how technicality & physics law can be included with designing elements to develop an Android app with user engaging experience. So, What Is New You Will Get From Material Designing? New Animations, styles, layouts, components, patterns, usability etc., the entire package of creativity has been offered to mobile app designers from Material Design. This principle depends upon the nature of the material that how it look likes in a varied amount of light, how they will look like while mounded up one above another. This principle lies upon edges, shadows, Dimensions. This principle depends upon design, color, font etc. Intentional white space in designing, utilization of bold font, and implementation of synchronizing a set of colors along with thoughtful graphics to accomplish user’s requirement is the second principle. Though Material designing is enriched with Animations, they come out as the result of the user’s primary actions and follow their cues. Material Designing has added some mind-blowing changes in navigation and has made navigating easily to users. It has been added three kinds of level to browse from one level to next to another. Material Design has introduced another overwhelming design is Lighten the scrolling. Notification should also be summarized. Layouts: Google offered expanded Layouts along with the launch of Material Design. Adaptive UI: Google has covered mainly four things under Adaptive UI which is responsive layout guidance, different breakpoints, grids, and patterns. The next visual treat is the “color palette” that they have introduced. A wide range of colors and the shades are just spectacular. This color palette contains primary and accent colors, which can be utilized to develop your brand color or some vivid elements for your app. All the colors are designed to work cordially with each other. Google has introduced 500 primary colors as the primary colors for your app and different as accent colors. Google has provided a visible benefit with the launch of “Material Designing” known as Imagery. It is more than to decorate your app designing but it is an efficient tool for communicating with the users and competing with the competitors. How you are representing your context regarding its image shows a great deal about the app, and that is “Imagery” is all about. It helps to make your app’s image more appealing so that users can rip their eyes off. This factor helps in user-engagement. Pickers give the more straightforward and the more natural way to choose a single value from a pre-decided set. There are two types of pickers, which is defined in “Material Design”. Date pickers: Date pickers get adjusted automatically as per the format in the locale: For US it is Month-Day- Year and for other regions it is Day-Month-Year. Time Pickers: Time Pickers get adjusted as per the time formats that a user chooses. We have seen and Analyze “Material Design” is the best launch similarly as application designing, functionality and ease of use through your application is a concern. Android applications are ending up even more engaging, alluring and easy to use because of the launch of this new plan rules by Google, exceptionally for Android app development. RipenApps is just master in using the designer guidelines “Material Design” into their apps. We make striking Android App designs with the maximum use of “Material Design” and satisfy our clients and the users with what they want and prefer.